Robert, Count of Mortain (c. 1031–1090) was a Norman nobleman and the half-brother of William the Conqueror and brother of Odo. He was one of the known participants at the Battle of Hastings in 1066 and, thanks to his share in the spoils of the invasion campaign, by the time of the Domesday Book in 1086 he was one of the greatest landholders in England as tenant-in-chief in twenty counties, with a total of 797 manors. His lands in Somerset, including Yeovil's future Manor of Kingston, have been calculated as equal in value to one tenth of the county's total assessment. The overall worth of his estates was £2,100. In early 1066, Robert was present at both the first council, that of William's inner circle, and the second larger council held to discuss the Duke's planned conquest of England. Robert provided 120 ships of the invasion fleet and was present at the following Battle of Hastings in 1066. 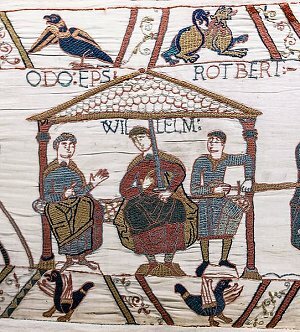 The illustration above, from the Bayeux Tapestry, shows Robert seated at right with his brothers William and Odo at a dinner at Pevensey on the day of the landing in England. In 1069 he is known to have led an army against a force of Danes in Lindsay but there is little mention of him thereafter. He administered most of his southwestern holdings from Launceston in Cornwall and Montacute in Somerset, just four miles west of Yeovil, but he seems to have been something of an absentee landholder, preferring to spend the majority of his time in Normandy. Together with his brother Odo he participated in a revolt in 1088 against William II but was later pardoned. On 8 December 1090 Robert died and was buried at the Abbey of Grestain, Normandy, near his father. He was succeeded by his son, William, Count of Mortain, who became tenant-in-chief of his father's Yeovil holdings.